I love the way the heart is made. This beautiful birthstone heart necklace is finely crafted of sterling silver with rhodium plating to avoid tarnish. This heart birthstone necklace showcases heart shaped gemstones and a diamond accent the shimmers. Simple and stylish, this heart birthstone necklace will look great with your everyday ensemble. This birthstone necklace is a delicate and sweet everyday accessory that will compliment any repertoire as it is surely eye-catching. This silver heart pendant is strung on a sterling silver 18 inch cable chain that is sleek and elegant that secures with a spring ring clasp. The gemstone cut of this women's necklace is fancy and has prong setting, providing security. This sterling silver necklace holds 2 gemstones and round cut diamonds. This stunning silver womens necklace can be worn solo for a casual look, or can be worn with any formal attire as the high polish finish on this necklace radiates along with the gemstone and diamond sparkle. This heart shape necklace is feminine and a classic gorgeous accessory that is timeless. This birthstone necklace is well suited for women or girls. This sterling silver rhodium plated heart birthstone necklace is the perfect gift idea for yourself or a loved one for occasions such as birthday, graduation, holiday, Mother's Day, Valentine's Day, or any special occasion, as this designer chain necklace is a definite must have. 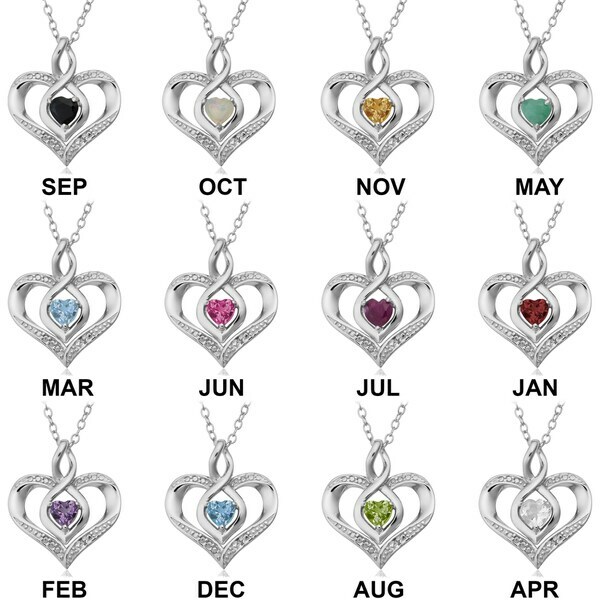 The heart birthstone necklace is perfect for my grand-daughter whose birthday is in September. She is 14 years old. The necklace comes with a white jewelry pouch. Very good quality. Beautiful and very delicate. Bought this for my daughter and she loves this necklace. It is very simple yet elegant. I purchased this a a birthday gift. The recipient loves it and it was of highest quality. The length was just right and it can be worn with diamond or birthstone jewelry. I would recommend this purchase it is a very nice necklace and a at great price. I bought this necklace as a Christmas present for my niece and it was to cheap looking for me to even give it to her. I would never give this as a gift. I won't recommend this product as I was quite disappointed when I opened it. I had to purchase a different chain to help the appearance of it. It was a gift for a family member and I wasn't sure if I wanted to give it to her. Sorry to express this but I was very disappointed. Great price and i would recommended this to a friend!! Nice but very delicate. Good quality. Small piece. Appears larger in ad. I purchased this for my granddaughter's birthday. She absolutely loved it. It is very delicate and perfect for an eleven-year-old girl. Gem was too small & not a deep enough green color for Emerald. "Does the chain or pendant change color over time? " This is my Mothers Birthstone... Ordered for my Mom.